Guess who is coming back? That’s right! Calhoun County’s very own Debbie Walker, from Deb Ann’s Fabrics, in Hillsboro, West Virginia, will be back in Grantsville on 3 November 2018. This time the quilt project will be a “Carpenter’s Star”. Class will be held at the Grantsville Senior Center (125 Durst Court, Grantsville, WV) on Saturday, 3 November 2018 from 10:00 am to ???. 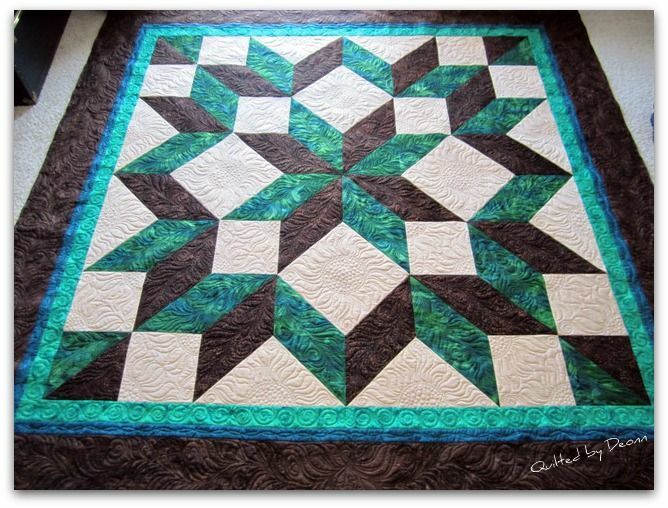 Join us to learn how to create a “Carpenter’s Star” quilt. Bring a lunch. Light snacks and drinks will be provided. Your supply list is as follows: sewing machine (in good working order), neutral colored thread, at least three wound bobbins, scissors, pins, a travel ironing space and cutting mat (PLEASE NOTE: there will be cutting and ironing stations set up if you don’t have your own), one 6 1/2″ – 8 1/2″ ruler or longer and a rotary cutter. Kits will be provided with two colors of your choice. Cost of the class is $50.00 and this includes the cost of the kit. If interested, please call 304 653-4150 to sign up and to provide your two color choices for your kit. See you soon!